What is impetigo? What causes impetigo? What are the types of impetigo? What are impetigo symptoms and signs? What does impetigo look like? How do health care professionals diagnose impetigo? What is the medical treatment for impetigo? What is the prognosis of impetigo? What are possible complications of impetigo? Is it possible to prevent impetigo? What is the contagious period of impetigo? What is the incubation period of impetigo? What types of specialists treat impetigo? Impetigo is a bacterial skin infection. Impetigo is more common in children than in adults. The two types of impetigo are nonbullous and bullous impetigo. dark or honey-colored crust that forms after the pustules burst. Impetigo is contagious and is caused by strains of both staph and strep bacteria. Impetigo is not serious and is easy to treat with either prescription topical or oral antibiotics. Scarring is very rare. Impetigo (pronounced im-puh-TIE-go) is a contagious, superficial infection of the skin caused by Staphylococcus (staph) and Streptococcus (strep) bacteria. Impetigo is more common in children (especially 2- to 5-year-olds) than in adults. Impetigo is most likely to occur in warm and humid environments and is most commonly spread by close contact (such as between family members). Many years ago the formal name for this disease was "impetigo contageosum." Source: Color Atlas of Pediatric Dermatology Samuel Weinberg, Neil S. Prose, Leonard Kristal Copyright 2008, 1998, 1990, 1975 by The McGraw-Hill Companies. All Rights reserved. Nonbullous impetigo: This is the more common form, caused by both staph and strep bacteria. This form initially manifests as small red papules similar to insect bites. These lesions rapidly evolve to small blisters and then to pustules that finally scab over with a characteristic honey-colored crust. This entire process usually takes about one week. These lesions often start around the nose and on the face, but less frequently they may also affect the arms and legs. At times, there may be non-tender but swollen lymph nodes (glands) nearby. 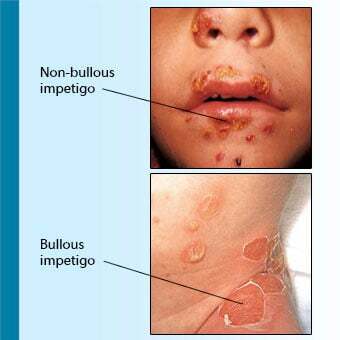 Bullous impetigo: This form of impetigo is caused only by staph bacteria. These bacteria produce a toxin that reduces cell-to-cell stickiness (adhesion), causing separation between the top skin layer (epidermis) and the lower layer (dermis). This leads to the formation of a blister. (The medical term for blister is bulla.) Bullae can appear in various skin areas, especially the buttocks and trunk. These blisters are fragile and contain a clear yellow-colored fluid. The bullae are delicate and often break with the overlying "roof" of skin lost, leaving red, raw skin with a ragged edge. A dark crust will commonly develop during the final stages of development. With healing, this crust will resolve. Impetigo is contagious, primarily from direct contact with someone who has it, but sometimes from towels, toys, clothing, or household items. After starting in one location, impetigo often spreads to other parts of the body. This is particularly common with impetigo in children. There may be mini epidemics in day care centers. Bacteria that cause impetigo may enter through a break in the skin, such as that which comes from cuts and scrapes. A common child impetigo experience is the development of impetigo lesions at the nasal openings inflamed by the prominent nasal drainage associated with a cold. In this situation, skin integrity is often disrupted by the continuous covering of purulent nasal discharge. Adults often develop impetigo from close contact with infected children. Heat, humidity, and the presence of eczema predispose a person to developing impetigo. Recurrent impetigo infections may be associated with staph or strep bacteria residing in the nose and spreading from to other parts of the skin. Diagnosing an impetigo infection is generally straightforward and based on the clinical appearance. Occasionally, other conditions may look something like impetigo. Skin infections such as tinea ("ringworm") or scabies (mites) may be confused with impetigo. It is important to note that not every sore or blister means an impetigo infection. At times, other infected and noninfected skin diseases produce blister-like skin inflammation. Such conditions include herpes cold sores, chickenpox, poison ivy, skin allergies, eczema, and insect bites. Secondary skin infections may sometimes occur. Medical evaluation and occasionally culture tests are used to decide whether topical antibacterial creams will suffice or whether oral antibiotics will be necessary. An impetigo infection is not serious and is very treatable. 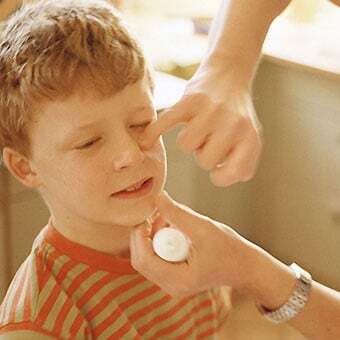 Mild impetigo can be handled by gentle cleansing of the sores, removing crusts from the infected person, and applying the prescription-strength antibiotic ointment mupirocin (Bactroban). Nonprescription topical antibiotic ointments (such as Neosporin) generally are not effective. More severe or widespread impetigo, especially of bullous impetigo, may require oral antibiotic medication. In recent years, more staph germs have developed resistance to standard antibiotics. Bacterial culture tests can help a doctor to guide the use of proper oral therapy if needed. Antibiotics which can be helpful include penicillin derivatives (such as amoxicillin-clavulanic acid [Augmentin]) and cephalosporins such as cephalexin (Keflex). If clinical suspicion supported by culture results show other bacteria, such as drug-resistant staph (methicillin-resistant Staphylococcus aureus or MRSA), other antibiotics such as clindamycin or trimethoprim-sulfamethoxazole (Bactrim or Septra) may be necessary. Treatment is guided by laboratory results (culture and sensitivity tests). An excellent prognosis of complete cure and recovery of the infected area is anticipated when impetigo is treated. In fact, many specialists in infectious diseases would propose that a poor response to appropriate antibiotic therapy should raise concerns regarding the accuracy of the diagnosis. A potentially serious but rare complication of impetigo caused by strep bacteria is glomerulonephritis, a condition producing kidney inflammation. Many specialists are not convinced that treating impetigo will prevent glomerulonephritis from occurring. Because the crusts and blisters of impetigo are superficial, impetigo generally does not leave scars. Affected skin looks red for a while after the crusts go away, but this redness fades in a matter of days to weeks. Once the skin has healed, sunscreen application is indicated. Routine hand washing with soap and warm water is an important and effective mechanism to prevent the spread of impetigo. Impetigo is generally felt to be contagious during the first 24 hours of appropriate antibiotic therapy. A bandage covering the infected area should be applied during this time. The incubation period (the time between exposure to the bacteria and the first development of symptoms) depends on the infective bacteria. 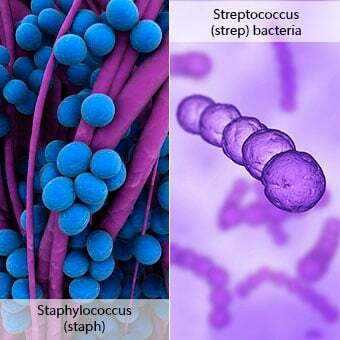 Strep-caused impetigo has a shorter incubation period (one to three days) than staph-caused impetigo (four to 10 days). A primary care doctor -- pediatrician, family practice doctor, or internist -- can routinely manage evaluation and treatment of impetigo. If there are unusual health issues or no response to appropriate antibiotic therapy, a specialist in infectious diseases could be consulted. Paller, A.S., and A.J. Mancini. Hurwitz Clinical Pediatric Dermatology, 3rd Edition. London: Elsevier, 2006: 366-367. Tessaro, Mark Oliver. "Visual Diagnosis: A Boy with a Fever and a Swollen, Blistering Finger." Pediatrics in Review 37.5 May 2016.